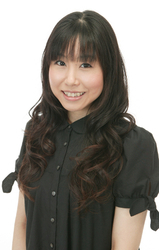 Ai Maeda is a Japanese seiyuu (or voice actress) and singer affiliated with Aoni Production. She is most well known for both being the voice of "Mimi Tachikawa" from the two Digimon Adventure seasons of the anime, as well as performing the ending themes from Digimon Adventure through to Digimon Frontier. Aside from singing for the Digimon franchise, she has also pursued a singing career as the artist AiM. Through this she has performed songs for F-Zero: GP Legend, Pretty Cure, and Bomberman among others; not limiting herself as an anisong singer, she performs and writes lyrics for her own original songs. Outside of her role as Mimi, Ai's voice is also recognized in other popular anime and games. In anime, she can be heard as the voices of "Paola" from Beet the Vandel Buster, "Megumi" from Zatch Bell, "Karen Minatsuki / Cure Aqua" from the Pretty Cure series and perhaps most famously as "young O-Ren Ishii" for the anime segment of Quentin Taratino's feature film Kill Bill Vol 1. She is also the new voice of "Sailor Pluto" in Pretty Guardian Sailor Moon Crystal. In the video game world she is known for voicing "Shion Uzuki" from the Xenosaga series, "Yue / Aria" from Rune Factory 2, "Oichi" from Samurai Warriors and "Chihiro Fushimi" from Persona 3. In the Japanese version of the video game anime adaptation Halo Legends, she also voices "Cortana".